Orbital-beam hexode electron-multiplier VHF amplifier (secondary emission). The valve measures 55x50mm overall (25mm across the body). 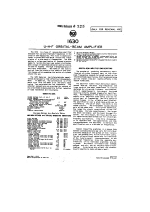 The 1630 orbital-beam hexode was used in early SCR-270 radar sets at 106 MHz (also used in Pearl Harbor) as an electron multiplier preamplifier. Due to noise and reliability issues and short working life of about 50 hours only, it was eventually replaced by a module using 6J4 triodes. The 1630 was also used in Grote Reber's pre-war radio telescopes at 480 MHz, with a 4 stage amplifier providing 100 db of gain. How it works: Actually the gain chain is formed by a tetrode, with an additional focusing electrode, and by a secondary emission amplifier. Electrons come off the cathode, pass through the control and the screen grids and then are accelerated in two curves inside a round beam forming electrode. The two beams, moving in opposite directions, impinge a V-shaped dynode, whose coated surfaces emit several electrons for each hit. These "new" electrons move toward the collecting anode that algebraically sums the electrons resulting from the two beams. As result the signal, common to beams from both directions, is enhanced while random noise is attenuated. Wikipedia: "In the 1930s special amplifying tubes were developed which deliberately "folded" the electron beam, by having it strike a dynode to be reflected into the anode. This had the effect of increasing the plate-grid distance for a given tube size, increasing the transconductance of the tube and reducing its noise figure. 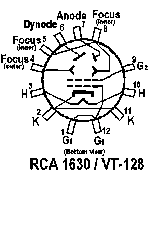 A typical such "orbital beam hexode" was the RCA 1630, introduced in 1939. Because the heavy electron current in such tubes damaged the dynode surface rapidly, their lifetime tended to be very short compared to conventional tubes." But guest Nicholas Bodley, Waltham, USA informed us: "The Wikipedia text that says short tube life was due to high currents is not correct. 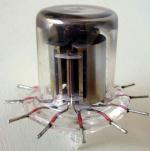 The dynode material "poisoned" the cathode of the 1630, causing the cathode's emission to decrease considerably. This cathode "poisoning" was a problem in all secondary-emission tubes until Philips developed the EFP60, toward the end of the tube era."